Your romantic partner wants to “get healthy and fit.” In fact, it is something that he or she has been struggling with for years, with only partial success. In situations like this one, providing your partner with support is great – you not only earn brownie points but you also help your partner feel better and cope with setbacks. But nothing is ever that simple –providing the right kind of support is hard to do! On one hand, there is good evidence that being a source of support for your romantic partner helps them achieve their goals and fosters their health and happiness (Overall, Fletcher & Simpson, 2010; Uchino, Cacioppo & Kiecolt-Glaser, 1996). When people perceive their partners as supportive, they are more motivated to go for their daily run and they feel better about their progress. On the other hand, actual supportive acts can increase partners’ anxieties and undermine their belief they can overcome challenges and achieve their goals (Bolger, Zuckermann & Kessler, 2000; Howland & Simpson, 2010). So how do our partners’ feel when we grab that chocolate treat out of their hand? They might get upset that they couldn’t resist temptation and needed our intervention. Why does support sometimes have benefits and sometimes have costs? Recent advances in social psychology suggest that the answer lies in the relative visibility of support. When support is direct and overt—called visible support— it tends to trigger anxiety and depressed mood in support recipients because it communicates that they need help from others and produces feelings of incompetence and indebtedness (Bolger et al., 2000). In contrast, when support is indirect and covert and goes unnoticed by support recipients — called invisible support— it bypasses these costs. So, for example, telling your partner you didn’t buy chocolate so they don’t get tempted is behavior that supports the partner’s goal but is obvious or visible to the partner and probably makes him/her feel as though you have little confidence in them (and that you think they shouldn’t have chocolate!). In contrast, background helping behaviors such as buying healthier food when you go grocery shopping without mentioning your reasons for doing so or referring to your partner’s goal, supports the goal but also avoids making your partner feel incompetent and in need of your help. In our recent research published in Personality and Social Psychology Bulletin (Girme, Overall & Simpson, 2013) we asked two novel questions that research had yet to provide answers to: Do the costs of visible support depend on the contextual needs of the support recipient? Does invisible support have long-term benefits by facilitating actual goal achievement? Sixty-one couples engaged in two video-recorded discussions in which one partner (support recipient) discussed a personal goal with the other partner (support provider). The degree to which emotional forms of visible and invisible support behaviors were enacted by the support provider were rated by independent coders. We gathered reports of the support recipients’ distress during the discussion, how supported they felt, and how successful they felt the discussion was in facilitating their goal achievement. Recipients also reported their goal achievement at 3-month intervals over the following year. Visible support involved directly providing reassurance and advice (e.g., being a cheerleader: “you can do it, that’s a great idea!”). Consistent with prior research, and despite the positive and supportive nature of this reassurance, the more partners were rated as providing visible support, the less confident support recipients felt about achieving their goal. But, this was only for those people who were less stressed and upset (see Figure 1, solid line). In contrast, we found that greater visible support was very beneficial for recipients who were distressed and therefore needed their partner’s direct reassurance. 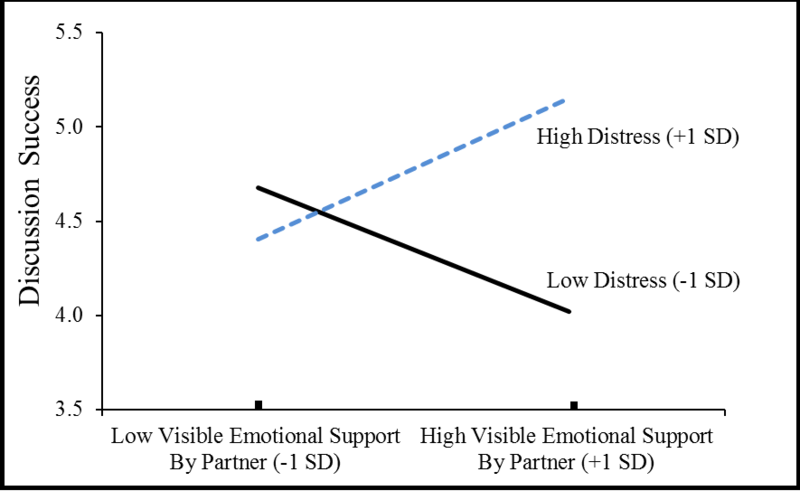 For these distressed recipients (see Figure 1, dotted line), greater visible support by the partner was associated with feeling more supported and more confident about achieving their goal. Thus, these results suggest that visible support only has costs when partners don’t really need high levels of reassurance and direct support. Figure 1. Interaction between support recipients’ level of distress and visible emotional support provided by the partner on support recipients’ perceptions of discussion success. This kind of subtle support went completely unnoticed by support recipients—that is, it was not associated with support recipients felt support or confidence about achieving their goal. But, these invisible support behaviors that went unnoticed during the discussion predicted greater goal achievement over the next year. We think these behaviors facilitate goal achievement because they guide the partner in ways that ‘plant the seed’ of goal-related strategies that recipients adopt as their own, enable recipients to take ownership over their own coping and problem solving, and thus bolster actual goal accomplishment. These results help to reconcile the conflicting costs and benefits of support by taking into account the needs of the support recipient. Visible and direct support are most effective in the short-term for recipients who are experiencing distress and need their partners’ overt reassurance and care to make them feel better. In contrast, invisible and subtle forms of support that go unnoticed in the short-term are most effective in facilitating recipients’ long-term goal achievement. The conclusion: Being a supportive partner is not always about providing direct forms of care, love and affection, but about being responsive to whether partners need comforting in the short-term versus subtle encouragement to own their goal progress and achieve long-term success. Yuthika Girme is a PhD Candidate at the University of Auckland. Her primary research goals involve identifying the ways people can effectively provide support, generate closeness and overcome insecurities in order to maximize the health benefits arising from supportive relationships. Nickola Overall is an Associate Professor at the University of Auckland, New Zealand. Her research interests focus on dyadic processes within close relationships, including identifying the factors that determine the relative success of different communication strategies used when couples are trying to resolve relationship problems or support each other. Jeff Simpson is a Professor of Psychology at the University of Minnesota. His research interests center on adult attachment processes, evolution and social behavior, communication and social influence in relationships, and how early life experiences affect adult health and relationship outcomes. Girme, Y. U., Overall, N. C., & Simpson, J. A. (2013). When Visibility Matters: Short-term versus Long-term Costs and Benefits of Visible and Invisible Support. Personality and Social Psychology Bulletin. Howland, M., & Simpson, J. A. (2010). Getting in under the radar: A dyadic view of invisible support. Psychological Science, 21(12), 1878-1885. Overall, N. C., Fletcher, G. J. O., & Simpson, J. A. (2010). Helping each other grow: Romantic partner support, self-improvement, and relationship quality. Personality and Social Psychology Bulletin, 36 (11), 1496-1513. Uchino, B. N., Cacioppo, J. T., & Kiecolt-Glaser, J. K. (1996). The relationship between social support and physiological processes: A review with emphasis on underlying mechanisms and implications for health. Psychological Bulletin, 119, 448-531. ← Does Cultural Exposure Partially Explain the Association Between Personality and Political Orientation? This is a great point, very important, please comment and share your experiences.